Why can’t I wear a bindi to the music festival? Looking at cultural appropriation. If you pay any attention to celebrity gossip sites, you know that Kim and Kanye threw a Coachella-themed birthday party for little North West this past weekend. 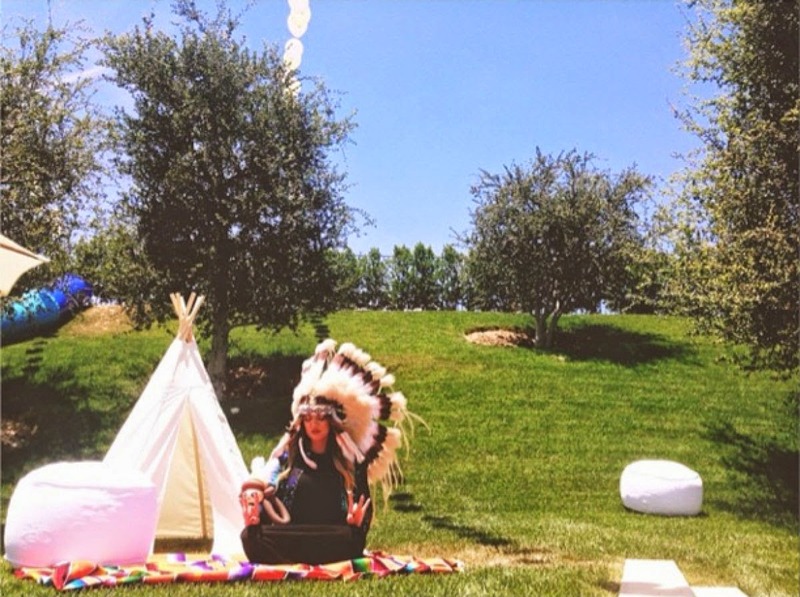 However, what a lot of people are talking about (besides North’s outfit and the fact that there are pictures of Kanye actually smiling) is a picture of Khloe Kardashian, Kim’s sister, wearing a giant Native American headdress as she sits next to a tipi. As this picture comes on the tail of actual Coachella, with its legions of white girls sporting bindis, I figured this was a good time to talk about cultural appropriation. While the technical definition of cultural appropriation is a little broader, encompassing assimilation, I’m going to be discussing it in the way that it’s used in social justice blogs. The kind of cultural appropriation I’ll be talking about occurs when someone of a dominant culture takes aspects of a marginalized culture – its music, symbols, or clothing, for example – and uses them for their aesthetic value, as accessories, with little understanding of their original meaning. Miley Cyrus’s use of ratchet culture is a prime example. Cultural appropriation is disrespectful of the original cultures because it takes things that have meaning and importance (like Native American war bonnets or Hindu bindis) and strips them of their significance by using them as fashion statements. Actual people of that culture don’t benefit from appropriation, but designers and shops make money from it. This post discusses appropriation of Native American symbols. Another big problem with appropriation is the fact that the symbols appropriated are often ones that are devalued when they’re used by people of color. Sometimes these symbols were forcibly removed from a group when it was colonized, used as proof that the culture was “backwards” or uncivilized. When members of a privileged group “try on” these symbols with little appreciation of their history (both in their original meaning and the potential meaning forced on them by colonization) and without having to experience any of the oppression that these groups experienced, they replicate these power structures. (I’m aware that I’m speaking in super-general terms here; I’m just trying to give an overview of some of the issues). When Katy Perry dresses up as a geisha, she just sees herself as borrowing a very pretty aesthetic from Asian culture. However, geisha imagery is also used in other contexts to perpetuate stereotypes of Asian women as passive, servile, sexual objects. When Kesha wears cornrows, a bandana, and a grill, she’s being gritty or edgy, but when a black person wears them, they’re viewed as evidence that the person is less educated, less professional, or dangerous. It doesn’t matter whether the aesthetic borrowed is one that is positive or negative (i.e. – the “pretty” symbols of Perry’s geisha vs. Kesha’s “gangster” accessories, which might have more immediate associations with violence); as I discussed in my post about “good” stereotypes, any time a minority group is reduced to a few simplified symbols or stereotypes, it’s harmful. Cultural appropriation: is it ever okay? But my friend is ___ and he/she doesn’t care when I wear ___. OR I am ____ and it doesn’t bother me when people ___. That’s awesome. I’m sincerely glad that you or your friend aren’t bothered by appropriation, and that you can avoid the negativity surrounding the issues. However, that doesn’t mean that other people shouldn’t be, and it certainly doesn’t mean that cultural appropriation is suddenly exempt from all of the problems I listed above. But I’m celebrating and appreciating that culture! There are a lot of ways to celebrate different cultures without being appropriative. The best ways to do so are ways that provide you with education and support the group in question. Instead of wearing a headdress, visit a Native American museum. Attend a local cultural event. Instead of buying a generic “tribal print” skirt at the mall, purchase cloth or jewelry made by an African artist. Oh, so I guess I can’t wear plaid because it’s Scottish. OR What about people who appropriate white cultural artifacts? Um, no. See, non-white people who take on white fashions or ways of speaking or dressing are often doing so as a method of survival – they have no choice. Sometimes this is the result of colonization, as I mentioned above. Sometimes it’s the result of the pressure to assimilate into the majority culture in order to face less discrimination (I mean, think about it – when you’re told to dress “professionally” that’s kind of code for “white” – anything overtly “cultural” like a sari, traditional makeup, or dreadlocks might be coded as “unprofessional” in an office setting). A person of color who wears traditional dress instead of Western clothes is seen as backwards or different. Wearing “white” clothing is a way to fit in to the mainstream society. Now, I’m not claiming to be perfect here. I’m definitely not claiming that I’ve never appropriated from other cultures. There are instances from college – parties that I attended – that I’m actually too embarrassed to write about here, because of how inappropriate and culturally appropriative they were. We were young, white, and sheltered, and it was horribly stupid. And we certainly weren’t the only ones. It seems like every few months you hear stories about college fraternities or sororities getting in trouble for a party with a racist theme. While of course I think these parties are offensive, I also remember being younger, being from a mostly-white area, and not having any clue that using stereotypes for entertainment, regardless of how naïve your intentions, might be offensive. I do think it’s a little different today, in that platforms like Twitter and Tumblr spread awareness about these issues pretty quickly. But privilege really can blind you. The key is, when you’re called out on it, to listen, to understand, to apologize, and to change your behavior. Nice piece. It’s amazing how some people act so put out that they can’t appropriate someone else’s culture. As a white girl who’s rocked dreadlocks for over 6 years now, I found this post interesting. Would you consider white people sporting dreadlocks cultural appropriation? I used to always wear this necklace that had a big ohm symbol charm. I got comments multiple times from Indians (not the native kind). A few challenged me about it, asking if I knew what it meant. I did, and I seemed to be able to give them a satisfying enough answer. A few thought it was really cool. None ever voiced any negative thoughts about the necklace, but I’m aware that doesn’t mean they might not have been thinking it. It’s always hard to grapple with those kinds of issues when they relate to us! For instance, I used to work for a dance company that did primarily bellydance-themed shows. While I felt okay about doing that because the owner of the company was a Middle Eastern woman (she was also our dance instructor, and sold us our costumes, accessories, etc., so it wasn’t totally like we were profiting from appropriation while taking business away from someone who was actually a part of that culture), I now occasionally perform in a bellydance costume with a snake. This is cultural appropriation. But obviously I don’t feel bad enough about it to stop (partly because I’ve spent so much money on the costumes and lessons that I kind of feel justified in that way, and partly because I make much more money doing that than I do in my other three part-time jobs, and I really am a fan of paying my bills on time). That’s interesting that you were challenged on the ohm symbol. That’s one of the sticky points of cultural appropriation though – if there’s something from another culture that speaks to you, that you appreciate, and that you want to integrate into your life in some way, where is the line between appreciation and appropriation? Like, the ohm symbol is something that meant something to you and that you were knowledgable and respectful about, but I’m sure there are people who would feel that it wasn’t appropriate for you to wear it. I find that this is one of those topics that gets more difficult the more you think about it in specific terms! it’s always a little funny to me whenever I see a white person wearing dreads. Rastafarians started wearing their hair in locs as a protest against traditional european standards that demonized anything black. The use of locs came from a movement meant to inspire and uplift black people. It was a spiritual and religious thing in both black and Hindu culture, so either way you look at it, you’re stripping it of its meaning in order to rebel against the status quo and a comb. Every single white person I’ve ever seen (and I’ve seen a lot living in downtown Toronto) wearing dreads is doing it a disgrace and making a mockery out of it by allowing themselves to leave their house looking more like they got attacked by a few dozen hungry seagulls and barely made it out alive. All for the sake of being perceived as free-spirited and rebellious and being praised for their courage to be “different”, meanwhile black people who wear it as a protective style or as a homage to their culture, are perceived as dangerous, or are told they don’t look professional enough for the work field. So it’s always a little funny to me whenever I see a white person wearing dreads.